The oceans have warm and cold surface currents that act like a global heating and air-conditioning system. They bring significant warmth to high latitude areas that would otherwise be much cooler, and significant coolness to low latitude areas that would otherwise be much warmer. The currents also play a major role in determining the global geography of precipitation. The sun can more easily evaporate warm water than cold water, and thereby produce the atmospheric vapor that results in rain. Therefore, lands that get sideswiped or impacted by warm currents tend to have abundant precipitation in addition to a comparatively warm climate. Conversely, lands impacted by cold currents tend to receive very little precipitation in addition to a comparatively cool climate. Generally, surface currents exhibit circular movements (see Figure 1). North of the equator, the flow is usually clockwise. South of the equator, the flow tends to be counter-clockwise. These movements are principally products of prevailing winds that “push” the ocean’s surface. On the map you can see occasional exceptions to the general rules of circulation. They are the results of deflections caused by the angle at which a current strikes a land mass or the continental shelf, or by the direction of prevailing sea level winds at particular latitudes. 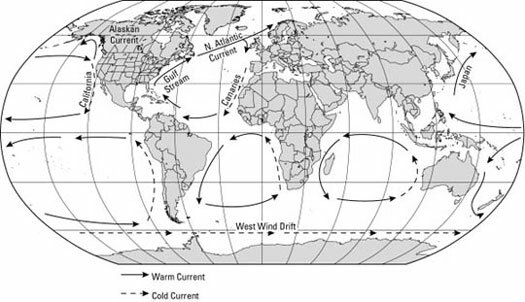 Figure 1: A generalized geography of ocean surface currents. The warm and cold portions of these circulatory systems have rather predictable geographies. As ocean currents move westward along the equator, they absorb lots of solar energy, heat up, and become warm currents. As they turn away from the equator, they generally continue to absorb about as much heat as they dissipate, at least while they remain in the Tropics — that is, the region between the Tropic of Cancer and the Tropic of Capricorn. After leaving the Tropics, the reverse starts to happen: The currents radiate more heat than they gain — but slowly. Thus, the currents remain comparatively warm longer after they have left the tropics. The Gulf Stream, for example, is a warm-water current that moves up the Eastern coast of the United States and then becomes the North Atlantic Current (see Figure 1). Although it loses a fair amount of heat as it moves eastward across the mid-Atlantic, the North Atlantic Current reaches Europe with a considerable amount of stored heat remaining. As it continues to radiate that heat, it contributes to the climate of Northwestern Europe a degree of warmth that is unusual for those latitudes, and also abundant rainfall. You should remember that climate is an average of yearly conditions, but that in any given year very “un-average-like” events can occur. El Niño and La Niña, which happen every so many years, provide good examples. (Niño and niña mean boy and girl in Spanish.) As you can see in the bottom part of Figure 2, during an El Niño, the surface waters become unusually warm in the tropical portion of the Pacific. The reasons for this aren’t fully understood; but because the conditions occur around Christmas in the waters off western South America, the local populace call it El Niño, referring to the Christ child. During La Niña, the opposite happens (“girl” being the opposite of “boy”) — the water is unusually cold. 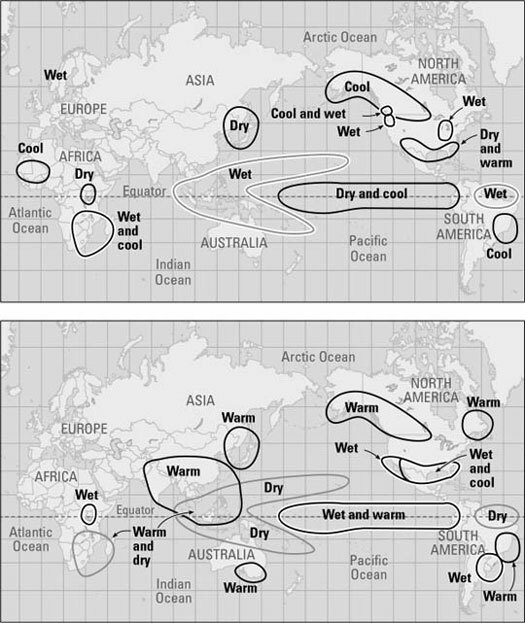 Figure 2: Conditions associated with La Niña (top) and El Niño (bottom). The affected ocean water circulates and also influences the behavior of atmospheric pressure belts, and the impact can be substantial and widespread. Just what that means varies from place to place and year to year. Sometimes, for example, rainy seasons become extremely stormy and dry seasons become prolonged droughts. On the other hand, the effects are not always bad, as may be evidenced perhaps by a normally harsh winter that turns up mild. Generally, the media have cast “the boy” and “the girl” as climatological brats. In some times and places, however, they are the most pleasant kids you’d ever want to have around.